Take advantage of this popular art form otherwise known as canvas stretch by displaying your next project on a canvas stretch. 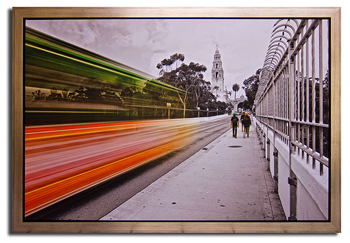 Our canvas stretch wraps your print, poster, or photo over a wooden frame as displayed to the right. There also is the option of repeating the edge so that your project can hang without a frame. There are a number of options to utilize the canvas medium. Gallery wrap is a method of canvas stretching so that the canvas wraps around the sides of the wooded frame. Another option is placing a digital print on canvas. A client sent us a PDF file to print a photograph taken in Europe. They wanted it printed on canvas and enlarged to a 40 x 60 image with enough space to gallery wrap. No problem. We not only had the print enlarged and printed on canvas, but we stretched and wrapped the canvas and then provided a floater frame to provide a finished look that would hang above their fireplace.